Split hoofs -- a good thing? The Torah designates two symbols that determine an animal is Kosher. 1, Chews its cud and 2, has split hoofs. All other “animals that walk on their paws, on all four, are not kosher”. Rashi – Rabbi Shlomo Yitzchaki, 1040-1105, the principal commentator on the Bible, offers examples of non-kosher animals, i.e. the cat, dog, and bear. A cat according to the Talmud has a major blemish in its thought processess, “it doesn’t acknowledge its owner.” While it is true the Talmud tells us, “had the Torah not been presented to the Jewish people, we would learn (the imperative) to be modest from a cat,” there is this major flaw with its intellect. A dog according to the Talmud, does acknowledge and recognize its owner and master. The Midrash says, ’’Dogs are smart.” The weakness in a dog is its problems with its emotions. All its intelligence is controlled and subservient to its emotions. The Talmud says, dogs are brazen animals. 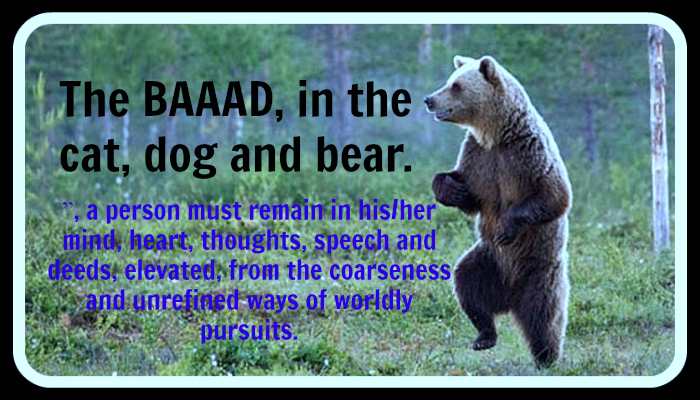 While the cat and the dog represent blemishes and weaknesses internally, regarding the intellect and emotions, the bear who is plump and heavy represents the coarseness of the external faculties of a person. The bear in its spiritual non-kosher status is represented in its faults regarding its external forms of communication, i.e. thought, speech and deed which are absorbed in materialistic and coarse pursuits. Like the Bear who is always restless and roaming about for more food, this person is always lacking internal peace and tranquility. The kosher animal on the other hand distinguishes itself from all others with its complete split hoofs that separate it from the ground. A Kosher animal does not walk directly on the ground. While the non-kosher animal walks on the ground and is connected to the materialism of the ground, kosher animals have the elevation that separates and lifts them from the ground. Only someone who recognizes the specialness of the human being over all other creatures and intentionally separates and elevates themselves from the physical ground can influence the ground by their own elevated status and not become drawn in by the magnetism and gravity of the ground, materialistic pursuits. It was only when Moses was on holy ground that G-d told him to “ take your shoes off from your feet.” In a place like the Temple where everything is imbued with G-dliness and spirituality, connecting to it all is imperative. On a typical basis, kosher and holy is keeping a clear demarcation and detachment, between the pursuits of worldly values and spiritual G-dly interests that bring true fulfillment and deep satisfaction. “I washed my feet, how could I make them sullied.” “How beautiful are the ornaments to your Shoes.” To be like a cat, dog, or bear, is to be unacceptable within the framework of Kosher and Holy. To be Kosher and to be G-dly, to be “a Holy nation unto Him”, a person must remain in his/her mind, heart, thoughts, speech and deeds, elevated, from the coarseness and unrefined ways of worldly pursuits. "Whoever is careful concerning these matters brings an additional measure of holiness and purity to his soul and purges his soul for the sake of the Holy One, blessed be He, as [Leviticus 11:44] states: "And you shall sanctify yourselves and you will be holy, for I am holy." ...to improve one's character and make one's conduct upright...Maimonides. The Torah compares the wholeness of a human being, to the tree of the field. There are four general categories to all of creation. The inanimate, vegetation, animals, human beings. Within the world and universe of a person, there is also these four categories. 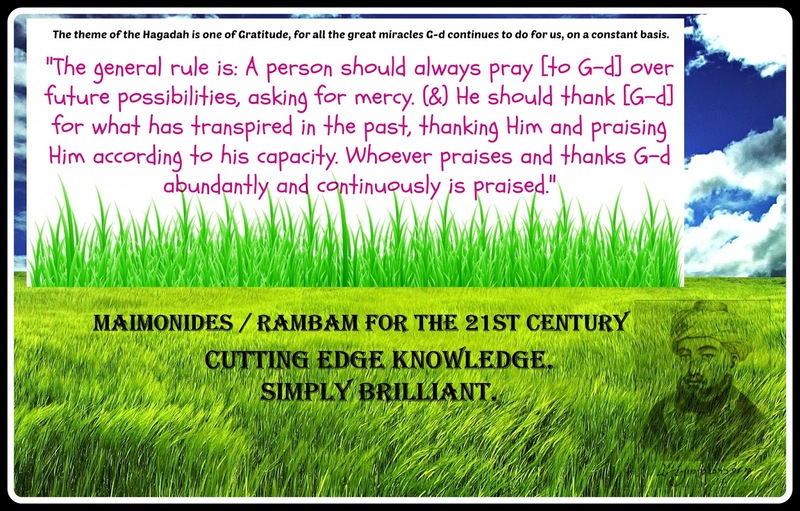 Says the Talmud, a person’s greatest nourishment and being comes from those things that grow in the field, vegetation and trees. The person is identified most by the category of “the tree.” One of the characteristics of a tree, is that as tall and as big as it grows, it is always deeply rooted and connected to the ground. Within a person, his emotions play the role of vegetation. Emotions grow as a person matures, and are more deeply rooted in the ground of a person’s soul than even his intellect (the role of animal). That is why it is very difficult to change the underlying nature of ones emotions and much easier to change the way one thinks. A person’s intellect is the animal category within himself and like an animal who has mobility and freedom to travel, a person through his thinking is able to put himself even in places that are against his very own nature. Although the edge of a human being over all creations is his/her intellect it is only when it has successfully expressed itself by making a mark on the emotions and through the emotions that the person has reached self-actualization. 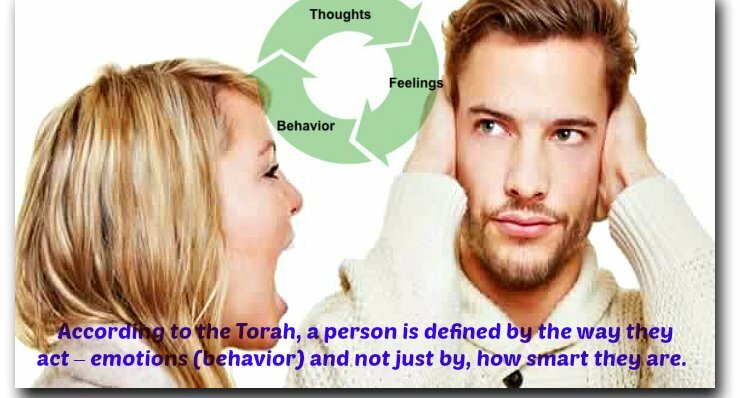 According to the Torah, a person is defined by the way they act – emotions/behavior, (compared to the tree) and not just by, how smart they are. Vegetation comes, from a higher source in the spiritual worlds, than the human being, and “fell” here in this world on a lower level than the person. This is the reason and explanation why & how it is able to nourish and sustain the person who is on a higher level here in this world. The emotions as they express themselves within a person are on a lower level than intellect. It is however up to the intellect to influence and transform the emotions so the person connects and experiences the greater force and life energy within the emotions, and once the emotions and character are changed this will feed and define the person. Within intellect itself there is also the four above-mentioned categories. It is only the purest and most sublime of thoughts that are not affected at all by emotions that can accomplish 100 % the above-mentioned goal of totally influencing the character of a person for the good. “All of these ordinances are to subjugate one's evil inclination and improve one's character. Similarly, most of the Torah's laws are nothing other than "counsels given from distance" from "He Who is of great counsel" to improve one's character and make one's conduct upright. And so it is written Proverbs 22:20-21: "Behold, I have written for you in the Torah prominent matters, to inform you of the veracity of the words of truth, so that you will respond truthfully to those who send to you." Maimonides Temurah Chap 4 Halacha 8.